There are not many science-fiction sets of plastic soldiers in 1:72 scale on the market. So far only Micro Machines/Galoob and recently McFarlane have released sets that usually include from 3 to 14 figures, typically from famous movies ("Star Wars", "Starship Troopers" in case of Galoob/Micro Machines) or computer games (recent Halo Micro Ops line from McFarlane). The traditional plastic set on the subject could be the Marx 'Astronauts and Aliens' set developed in the sixties - not much of a military subject though. The set developed by the Russian and Ukrainian team from Orion/Dark Dream Studio (DDS) seems to be aiming to fill a wide gap in the market by offering generic space soldiers that could be used in multiple settings for both modellers and wargamers. An ambitious task - did Orion/DDS managed to carry it out? The set DDS 72001 delivers 16+1 figures along with two fully pose-able walking battle vehicles. All elements are placed on the sprues in such a way that requires careful cutting out to avoid cutting an actual part. There are 8 different poses on one sprue, and there are two identical sprues of figures in the set as well as a manned walking vehicle with a pilot/driver figure. All the poses seem realistic. Those armed with rifles (kneeling and walking) cover their sectors or can be used for depiction of less intense shooting. Heavy weapons' operators hold their weapons at the ready. NCO - or commander of some sort - is depicted in universal management pose. The entire squad (2 x 2 fire teams) can be used for depicting patrol, sentry or fighting without manoeuvre. The man with a scanner/radar has both hands occupied with it and therefore only carries a side weapon. Weapons are a mixed bunch of several known and less-known origins. The rifle looks like a typically depicted "laser rifle" from various games or comic books in the '80s. It may not be the most attractive futuristic design of small arms in comparison to, say, M41A1 Pulse Rifle from "Aliens", Morita gun from "Starship Troopers" or even real projects like OICW or FN2000. Support weapons are two - something relatively similar to Smart Gun (from "Aliens" - a machine gun held on special support operated from the hip level) connected to a VR glasses of the operator and something that resembles L6 grenade launcher. Heavy weapons are also two of choice (their names are listed in the manual) and they are to be plugged on the figure - same as the scanner. Each soldier is also equipped with a side-arm held in a holster. Given the considerable size of the holster this seem to be an equivalent of a larger SMG/MP. Equipment is well thought out and seems to be taking from several popular culture icons as well (without directly copying them - the same applies to weapons). All soldiers wear soft suits, apparently capable of withstanding space conditions. On that, they wear rebreathers connected to helmets. The general idea was seen in many sci-fi movies, most fully in "Space: Above and Beyond". The rebreather apparatus has two devices sticking out of it on the shoulder level - could be lamps - this reminds us of the"Aliens" movie. The helmet - supposedly protecting both against hostile environment and impacts - has a small visor but a bunch of additions that could be cameras, targeting devices or anything else. These additions however not always contribute to a "clean" look. Combined with general quality of the mould they sometimes make this part of the figure very unclear. There are 2 smaller pouches on the belt (could be ammunition) and two larger on the backpack/rebreather. Each soldier wears body armor with large shoulder pads/pieces - a little too large and resembling some fancy costume concepts from several decades ago. Overall the individual equipment of these generic space soldiers looks logically placed. Sculpting is very good with crisp detail and kept proportions. Moulding is less precise, with flash and excessive plastic here and there so trimming is required. In some cases there is an impression like the moulds were dirty - especially when small excesses of plastic occur outside the joint line. Plugs do not always hold the equipment. In addition to the four fire teams the set supplies us with two combat vehicles, walking machines. First one is a manned light vehicle with opening canopy, movable legs (they can be positioned in any way) and gun. Internal detail includes cockpit, pilot and some elements of the engine. The only thing not included is a clear canopy part but it is not difficult to cut the desired element out of clear plastic. 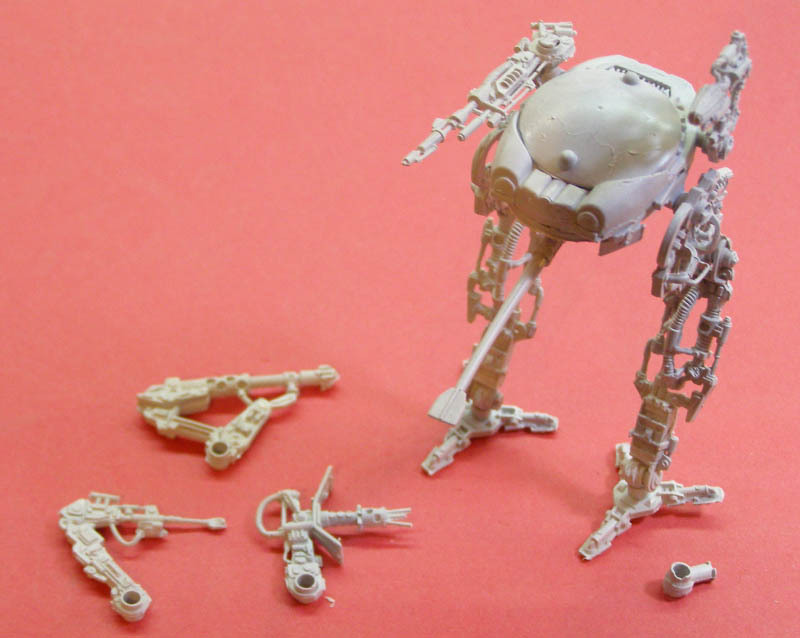 The design of the parts is so good that little filling is required after putting the model together to achieve a clean look, which is good as the soft plastic does not easily accept glue (CA glue works), filler or paint (base coat is required). When assembled, the model will measure approximately (depending on leg positioning) 6 cm (2,4 inches) tall. 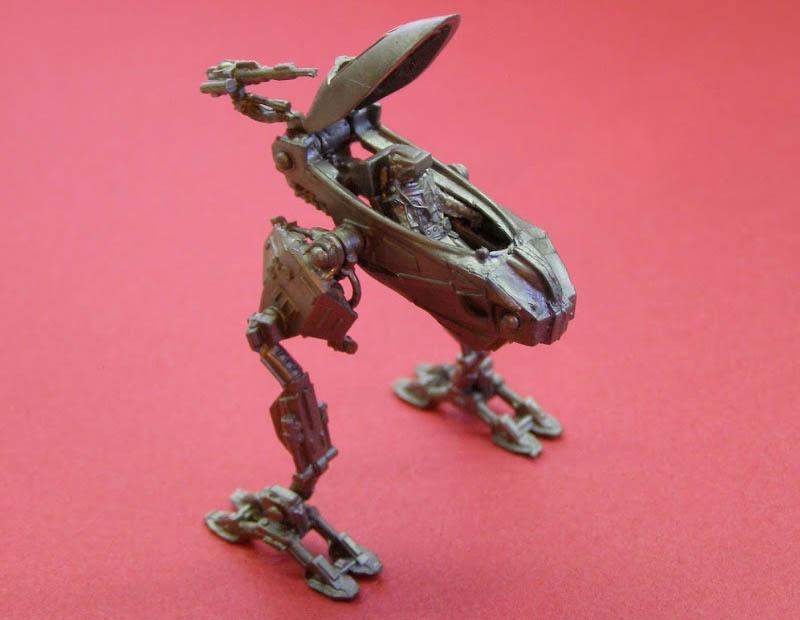 It's design is clear and logical and will make a great addition to any sci-fi diorama or wargaming scenario. As the entire set, this model has also the great potential for customizing. The moulds seem to be a bit clearer than the ones used for figures. It is worth noting that older versions of this set were moulded in steel-coloured plastic, but at the time of writing the plastic used was pale grey. The second model is an unmanned drone, bigger (circa 8 cm/ 3,15 inches when assembled) and more heavily armed. It is described as a machine controlled by bio-computer and surprisingly, this bio-computer is in the set! Looking like a very big brain with cables it has to be put inside the hull. The modeller can choose not to close the lid to leave it exposed (fair guess would be for maintenance purposes). Weapons of choice (5 different ones for 2 mounting racks) are very futuristic and pretty diverse so they should appeal to most tastes. If they fail, making a mount from green stuff or other modelling mass for a desired weapon platform (for example salvaged from other models) is pretty straightforward. Both models are excellent little pieces and putting them together is not difficult. To some, soft plastic may be an issue - trimming usually helps and is as unavoidable here as in case of figures. This set definitely delivers what it promises - a set of generic sci-fi soldiers supported by (or opposed by) convincing machines. Despite the visible residues of production process the entire set is a great addition to the collection. It has a tremendous potential for customizing (merely replacing helmets with bare heads gives a completely new look to these figures) but even made out of the box it will not disappoint. A must have for all 1:72 sci-fi modellers especially given the scarcity of the alternatives on the market.